superb villa with marvellous seaview at 180° and real private pool, located at 15 minutes from the airport of Malaga and at 5 minutes from the most beautiful beaches of the Costa del Sol. The villa is totally independant with a very nice garden and a lot of lemon trees, bouganvilleas, olive trees, birds of paradise ...absolute calm. ideal renting for lovers of sun, beach, family holiday, cultural visits in Andalusia, close to Marbella, Grenade, Ronda, Sevilla, Malaga, Gibraltar...and the white villages. The pool and the garden are maintained by a gardner. and there is a total privacy on the terraces and the patio. When we visited this house for the first time, 3 years ago, we fully fell in love with it , thanks to the marvellous garden and breathtaking view. We felt at home immediately. The house had a crazy charm . There were some terraces everywhere and all of them facing south to the sea. An area for the meals, an area for relaxation in the afternoon, an area next to the pool, and an other one to have an aperitif at sunset time. Fantastic!! My husband, sergean dentist, needed to be quiet when returning from his working day.in France. We decided to purchase it within one week. Today, after very big works on it, the house and the environment look like a real paradise.² from every side around, the landscape is magic and all the rooms lead to the terraces facing south and to the pool too. The atmosphere is magic; the light is unic like nowhere else. and the climate is very mild . Even in winter, the temperature does not fall under 15 degrees because there is a microclimate 30kms around the city of Malaga. The quality of life is exceptional in this house. it is a marvellous place where it is good to be alive.We never would change for nothing in the world!! Among the best points of “The Casbah” : the village of Benalmadena Pueblo is an authentic village, which does not look like a village to do with tourists; It is alive all year long because spanish people live in all year long. It is a place that you can leave from ,every morning, for a different trip and returning home every night. There are a lot of tourist spots not very far from the village like Marbella the old city, Grenade, Gibraltar, Malaga the old city, Cordoue, Ronda, Frigiliana, Neja and all “the white villages”. Unlike most of spanish houses, “The Casbah” is at street-level built; so, it is very easy to live “inside outside” all day long and enjoy all the terraces around the house depending on the hour of day . Having 2 bathrooms and 2 toilets is one of the best points as well in terms of comfort when there are several persons living in the house. Finally, the lifestyle in “The Casbah” is unic.The place is marvellous, facing full south and having a fantastic view to the sea without any building in the landscape, in a very quiet district of the village, and total privacy. No track of tourism. It is an exceptional way of life. We had a lovely stay at this villa. The villa and views were excellent, it is very well equipped with all that you need. Thomas was a lovely chap who was very helpful. I would highly recommend staying here. We had a great week. We had a brilliant time in this lovely villa.The views were amazing.Lovely pool.The villa was very clean and comfortable,and had everything we needed.Great outside space,with a barbecue,electric hotplate and fridgeThere are lots of different seating areas outside.The villa is in a quiet area ,but not far from the port and beach.Where there are lots of lovely restaurants.There is plenty to do in Benalmadena and the surrounding area.The villa has air conditioning and fans,as well as washing machine dishwasher,iron and ironing board which meant we didnt bring a lot of dirty washing home.It really is a lovely place,and we would love to go back some time.We had a great time there.Bastien the owner is really good at getting back to you quickly with answers to any questions you may have. We had a lovely time at the villa, the villa has the most stunning views, the villa was fully equipped with everything we needed, absolutely every thing had been thought of. The only down falls was the tv not working also internet not working properly. Which made it a little hard with kids although monopoly in the evenings helped. Tomas was amazing a lovely guy and could not do enough to help! Although I had some small negative comments this would not put be off returning again as I know they are things that would be taken note of. Contact with the owner was pretty much immediate on every occasion. He was always available to answer any queries and give good information. Had a fantastic 2 weeks at this lovely villa with my family. Very peaceful and quiet, and very tidy and clean. Gorgeous views from the villa. Lovely seating areas both in the shade and out. Sunshine right up until about 8pm. 5 min car journey to the beaches. Mijas is a must to visit. places to visit, lovely part of Spain inwhich we would return too, and this villa too. A good choice for a comfortable vacation for four. well planned with a spacious kitchen and two fresh bathrooms. and out, especially for children. and the seaview is just breathtaking. Outside are sunbeds, dinnertable and cane furniture for four persons. Inside the house, the beds are very comfortable, but the seating group is not. Het huis is van alle gemakken voorzien. Mooie keuken met alle keukenspullen aanwezig. Fijne veranda en zwembad met mooie tuin. Meerdere buitenzitjes onder veranda om samen te zitten. Wat een beetje onpraktisch was is dat er een slaapkamer buiten het huis zit. Dit is niet handig met jonge kinderen. Op de foto's staat het huis met allerlei schilderijen aan de muur en is het iets anders ingericht. In het echt is het wat kaal. De haakjes hingen er nog wel maar er hangen geen schilderijen meer. Maar het is netjes en schoon. Wat we merkten is dat het huis mooier is geweest en dat het een beetje onderhoud nodig heeft. Buitenlampen die het niet allemaal doen. Een buitenzitje waar de lampen stuk waren de kussens nat en overal bladeren etc. Het huis heeft een beetje meer liefde nodig... Maar het is er heel fijn vakantie vieren!! 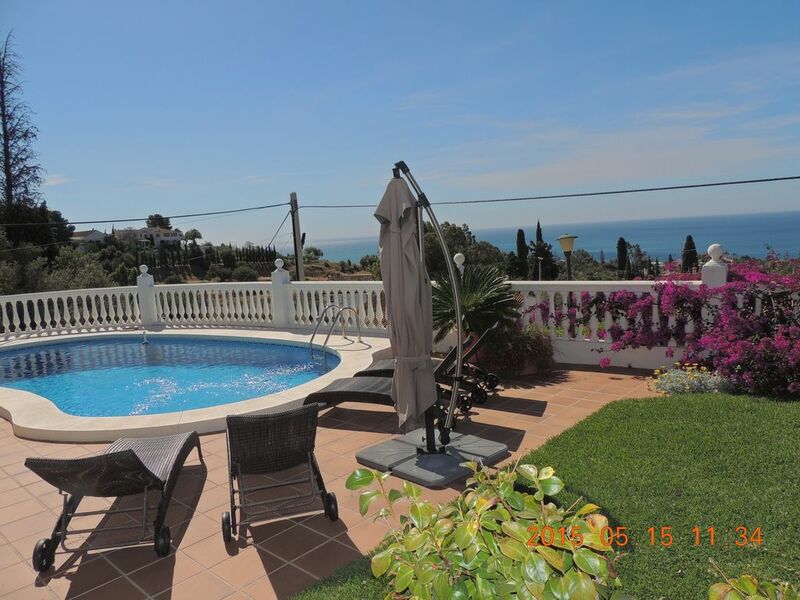 the villa is 1,5 kms far from the authentic andalus village of Benalmadena Pueblo, walking towards the sea in a very flowering district, 5 mn far away from the most beautiful beaches of the Costa del Sol. The airport is 15 minutes far from the villa and there are many low cost flights Ryanair or Easy jet. Many touristic places to visit near the property , like Marbella, and its old city and its marvellous beaches with white sand, its Alhambra,luxury stores, its yatchs and its fabulous restaurants and the night and day life. Seville, Grenade, Neja, Ronda and its historical past and all the white villages, Puerto Banus one of the most famous european ports. do not forget la SIERRA NEVADA and its fabulous landscapes. the first green is 5 kms far.